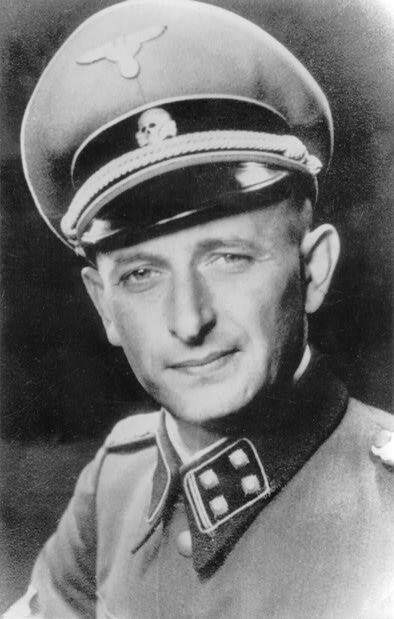 Adolf Eichmann (* 19th March 1906 in Solingen; † 31st May 1962 in Ramla near Tel Aviv) – son of an accountant, born in Nordrhein, but his family moved to Austria when he was a child. He did not graduate from school and became a sales rep for the Vacuum Oil Company. In 1932 he joined the NSDAP, moved to Germany and joined the SS. In 1935 he was called up to the SD division (Sicherheitsdienst, Security Division in SS) dealing with Jewish issues. After that, Eichmann ranked among the most active organisers of the “solution to the Jewish issue” at all its stages. First, he organised the forced emigration of Jews from Vienna and Prague, which served as a model for forced migration operations for Jews from the Reich (Reichszentrale für Jüdische Auswanderung in the Ministry of Internal Affairs). Once the war broke out his responsibilities expanded and he became head of the “resettlement department” in the Gestapo. His influence and significance exceeded his function as department head. It was he who, together with Heinrich Mueller, head of the Gestapo, organised plans for the resettlement of Jews from the Reich, Austria and Czech to the General Government (the so-called Jewish reserve planned in Nisko in the Podkarpacie region, and then near Lublin). Ultimately, the plan was not implemented because of resistance from the German administration in the General Government. He also participated in planning a gigantic ghetto for European Jews in Madagascar. Eichmann participated in a conference in Wannsee where representatives of several ministries and offices of the Third Reich made an “inter-ministry” arrangement concerning the details of murdering of European Jews. One of Eichmann’s main tasks was to coordinate train timetables in Europe, so that the transport of Jews to extermination places was regular and smooth. He never participated in executions directly, but he witnessed them. He was a typical armchair perpetrator. At the end of the war, Eichmann fled to Argentina. He was captured in 1960 by Israeli intelligence and put on trial in Jerusalem. His trial, publicised by all the media, was the first time public opinion was directly confronted with the Holocaust. Eichmann was responsible for murdering Jews, but his indictment also included other crimes against humanity. Point 9 of the indictment (in the category “crimes against humanity”) mentioned “deportation of about half a million Polish civilians to settle Germans in their place”. Eichmann was hanged and his ashes were dispersed at sea.